Indian Red Cross Society Odisha State Branch, Family Counselling Centre organized two Awareness Programmes at Bijayalaxmi slum and Nuagaon Village on Jan 27 and Jan 28 respectively. The programmes were held by involving local residents including adolescent girls, women, leaders and volunteers. The main objective of the awareness campaign was to promote family counseling and women empowerment. The programmes were inaugurated by Sri Ananta Narayan Jena Mayor of Bhubaneswar Municipal Corporation BMC), who graced the occasion as the Chief Guest. 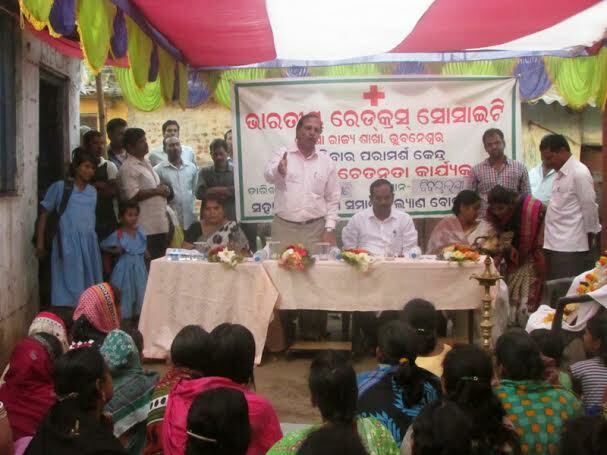 Dr. Chakradhar Panda, Honorary Secretary of Indian Red Cross Society, Odisha State Branch was Chief Speaker. Smt Harapriya Samanta Ray and Smt. Namrata Chadha Sub–Committee members of Family Counseling Centre, Smt K. Santi BMC Deputy Mayor and Biranchi Mahasupkar Corporater of Nuagaon Village graced the occasions as the Guests of Honour. Addressing on the occasion, Dr. Panda said that women bear almost all the responsibilities for meeting all the needs of the family. He advised the participants to avail the benefit of family counseling and other community welfare programmes of Red Cross Society. Smt. Harapriya Samanta Ray and Smt. Namrata Chadha explained the rules and objectives of Indian Red Cross Society and the objectives of Family Counseling Centre. In his address, Sri Ananta Narayan Jena, BMC Mayor, said that Indian Red Cross Society Odisha State Branch is an instrumental in Odisha, especially in humanitarian activities. The Programmes were coordinated by the Counsellors Miss Bijayalaxmi Kar and Miss Pritiprangya Dash. They discussed on various issues including dowry victim, extra marital affairs, economic crisis, mentally illness and interference of in-laws etc. The Programme was ended with a vote of thanks proposed by Miss Pritiprangya Dash.